It is nicely decorated with a welcoming atmosphere. On arrival you will be treated to Tea or Coffee and we be happy to help you in any way. The Botanical Gardens and Croke Park (one of the biggest stadiums in Europe) are a short walk away. We are also close to Dublin City University and the Helix Theatre. There are many pubs and restaurants situated near by.The Sunnybank Hotel and Bar with the Phraya Thai restaurant is just across the road. Also close are chinese, indian and italian restaurants. The Mater and Bon Secours Hospitals are also located in the surrounding area. We are located ten minutes from the City Centre and Temple Bar area by bus or car and about 15 minutes from Dublin Airport and Dublin Port Ferry Terminal. We have en-suite rooms with cable TV. Double/Twin/Triple or single rooms available. Breakfast is served between 8.30am and 10am approx. Full Irish, Vegetarian and Continential Breakfasts available. 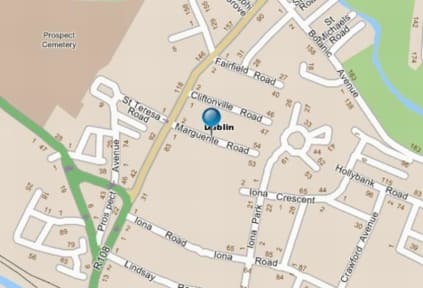 Marguerite House is located on Marguerite Road which is just off Botanic Road, Glasnevin. A Bus stop is just 2 minutes away. All routes take you into the City Centre.Buses include No 4,13,19,19a and 83. For more information, please contact us directly. My daughter and I had a great experience at Marguerite house. The hostess is lovely and helpful, breakfast was great and our schedule was accommodated. I would definitely stay here again! I had a lovely time! The breakfast is to die for, delicious! It was our 2nd time staying there. We would recommend it to family and friends. We'll be back! 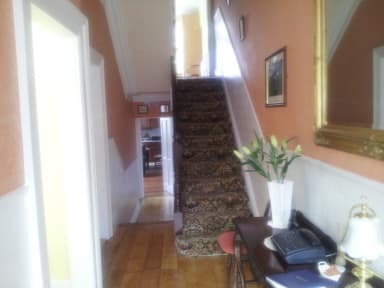 Very warm welcome and friendly host, free tea, coffee and cookies, delicious breakfast, very clean, 30 minutes walk to O'Connnell Street or 10 minutes by buy. All in all we had a great stay! This was a wonderful find. Eilish was very welcoming and helpful. We arrived a bit early and jet lagged . She offered us refreshments, explained how to take the bus to City Center and instantly made us comfortable. Her house is away from the frantic pace of Dublin and close to the Botanic Gardens. She suggested we have dinner at the Washerwoman restaurant which was delightful. Such a lovely inn with such a lovely hostess! The breakfast was scrumptious! Gorgeous room in a really quaint home. The only downside is it’s distance from the city center, but it might even be better for those trying to stay out of the hubbub. Our private room was so cozy, we wished we could have stayed longer. Eilish is very kind, and worked around our schedule. Way better than a typical city center, scratchy sheets, bare bones hostel. Would recommend (and would return)! Thoroughly enjoyed our stay. The proprietor couldn't do more to help us, she was exceptionally kind. There were good bus connections to the city centre and we were free to move about as we wished. Breakfast was excellent and the house was very clean. Would recommend. Great little B & B in Dublin. Quiet section of town with not too many restaurants or pubs. Fabulous breakfast. Clean rooms.. hostess was lovely.